As a Special Offer for returning Military to Civilian Transition Package Customers! If you have previously purchased an Military to Civilian Transition Deluxe, Grand or Ultimate Package you have the option now of purchasing additional Follow-up / Thank You Letters at any time during the discount period at this special reduced price. This custom-made Follow-up / Thank You Letter is designed to showcase your qualifications, strengths and highlights that will make you stand apart from the competition is priced exceptionally for $59.95. Don’t delay, order your letter today! 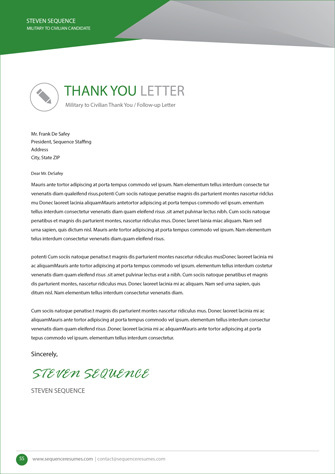 Let Sequence help you make a difference today with a compelling follow-up / thank you letter. We interact daily with some of the most well-known and respected employers throughout the U.S. and around the world. We know and understand what employers are looking for in a job candidate. It’s why our products and services are so successful at capturing their attention and can significantly increase your brand awareness in the job marketplace. Our letters are written to make you stand out after the interview.